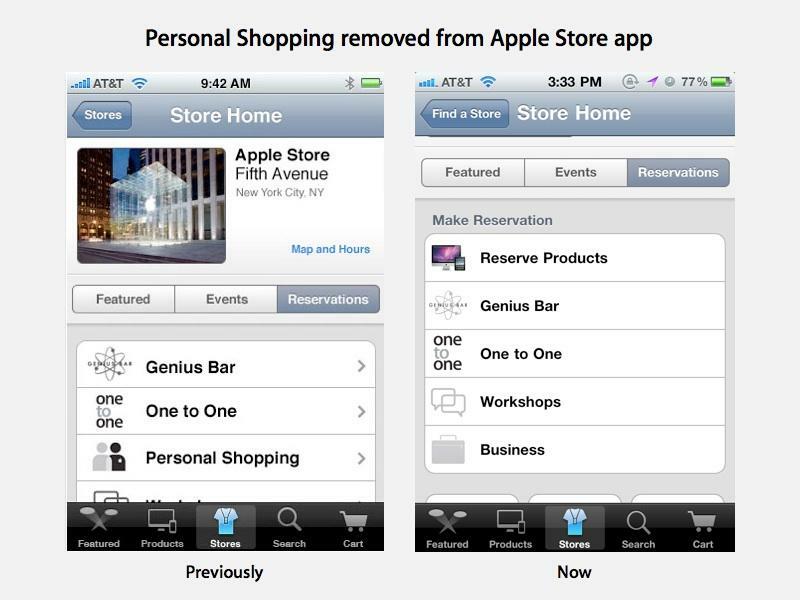 Apple has ended the Personal Shopping program in its retail stores, removing all mention of the service online and within its Apple Store iOS app. A report by ifoAppleStore notes that the elimination of Personal Shopping "became effective yesterday and stems from the belief that every customer should receive the same attention and amount of service." Originally set up in 2007 as a way for individuals to reserve an appointment with an Apple retail store employee, the company once described the program as "a whole new way to shop at the Apple Store." As a free service "where you and a dedicated Mac Specialist explore and test-drive products to find out which ones are best for you," the program was intended to foster an environment of personal attention within the company's retail outlets. "We know the store can be busy, so when youre ready to talk, Personal Shopping is a way for us to give you our undivided attention." However, as stores got busier, the premise of Personal Shopping became more difficult to deliver. At the launch of iPhone 3G in 2008, Apple suspended the program for iPhone-related visits. "It is critical that all stores follow the same process to ensure every customer has an equal and fair opportunity to purchase a phone," the company told its store managers.